Electoral significance has always distinguished the small northern state sandwiched between Lake Erie and the Ohio River. Only twice since the beginning of the twentieth century has Ohio failed to pick the candidate who ultimately won the presidential election. But presidential elections are only part of the Ohio story. That’s because the state has always been an innovator, an incubator, and a bellwether for the American experience. 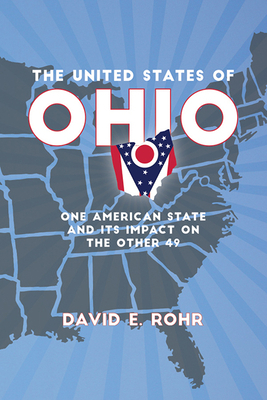 In a unique look at Ohio, David E. Rohr chronicles key stories that come from the Buckeye State and the remarkable effect Ohio’s development has had on the larger country. The United States of Ohio covers little-known facts about Ohio, such as how the state was the birthplace of both the National Football League and Major League Baseball and how it was Ohioans who led efforts toward racial integration in both sports. Readers will learn what makes the state a manufacturing and agricultural powerhouse—with both the largest tire company, Akron’s Goodyear, and the largest consumer products company, Cincinnati’s Proctor & Gamble, based there. The state grows, processes, and builds on a level that far outpaces the size of its population or expanse of its borders. And it is the birthplace of many prominent US figures—from Thomas Edison to John Glenn to Neil Armstrong. From sports to a century’s worth of entertainment superstars to aviation and space exploration, Ohio’s best have made for America’s greatest stories—all captured here in a look at the Buckeye State and its impact on the other forty-nine. Born and raised in Ohio, David E. Rohr spent his working career in the state until the age of twenty-nine. Even though he’s been a resident of other states since then, David remains a frequent Buckeye State visitor and an enthusiastic fan of Ohio sports teams.